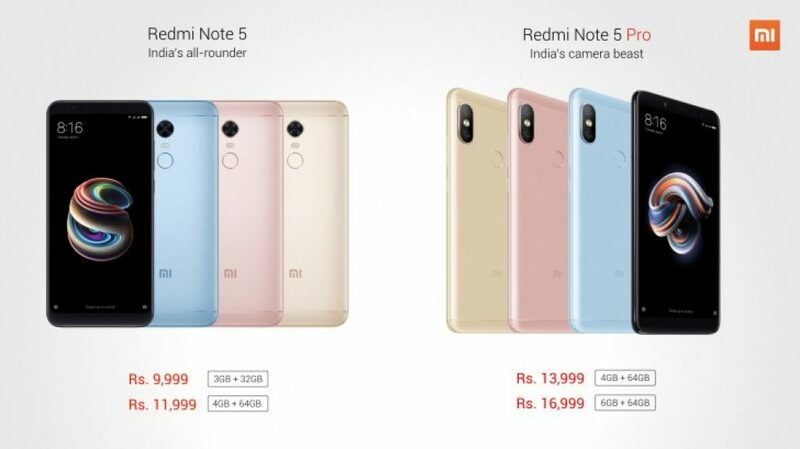 Xiaomi Redmi Note 5, Xiaomi Redmi Note 5 Pro models will be exclusively available via Flipkart in the country, apart from Mi.com and the Mi Home retail stores. The new Redmi Note 5 models will take the place of the popular Redmi Note 4 model in the company’s India portfolio. The biggest highlights of the new Xiaomi smartphones is the presence of the large 5.99-inch 18:9 display, the selfie-light module, as well as the large 4000mAh battery. Both Redmi Note 5 smartphones share similar specifications, with some major differences, like the use of a dual rear camera setup on the Redmi Note 5 Pro, and a high resolution front camera. A Face Unlock feature will arrive in March with an OTA update. The Xiaomi Redmi Note 5 price in India starts at Rs. 9,999 for the 3GB RAM, 32GB storage variant, and goes up to Rs. 11,999 for the 4GB RAM, 64GB storage variant. Colour options are Black, Gold, Lake Blue, and Rose Gold. It will go on sale from February 22 via Flipkart, Mi Home, and Mi.com. The smartphone will also go on sale soon via all of Xiaomi’s offline retail partners. As for launch offers, the smartphone comes with an ultra-slim case bundled, while Jio will be giving cashback worth Rs. 2,200 and 100 percent additional data on buying the new Redmi Note 5 and Redmi Note 5 Pro smartphones. The Xiaomi Redmi Note 5 price in India starts at Rs. 13,999 for the 4GB RAM, 64GB storage variant, and goes up to Rs. 16,999 for the 6GB RAM, 64GB storage variant. Colour options are Black, Gold, Lake Blue, and Rose Gold. It has the same release date as the Redmi Note 5 – February 22 – and will also be available via Flipkart, Mi Home, and Mi.com. Like the Redmi Note 5, it will go on sale soon via all of Xiaomi’s offline retail partners. It features the same launch offers as the Redmi Note 5. The Redmi Note 5 is in fact the India-variant of the Xiaomi Redmi 5 Plus, which was launched in China in December last year. The dual-SIM Xiaomi Redmi Note 5 runs MIUI 9 based on Android Nougat. It sports a 5.99-inch full-HD (1080×2160 pixels) display with an 18:9 aspect ratio, 450-nit brightness, 84 percent NTSC colour gamut, and 2.5D curved glass. It is powered by an octa-core Snapdragon 625 SoC, clocked at up to 2GHz, coupled with the Adreno 506 GPU and either 3GB or 4GB of RAM. It bears a fingerprint sensor on the rear panel. The Xiaomi Redmi Note 5 sports a 12-megapixel rear camera with an aperture of f/2.2, a 1.25-micron pixel size, PDAF, EIS, and an LED flash module. On the front, it bears a 5-megapixel sensor complete with an LED selfie-light module and Beautify 3.0 beautification tech. As we mentioned, the Xiaomi Redmi Note 5 comes in two storage variants – 32GB and 64GB – both of which are expandable via microSD card in a hybrid dual-SIM format. Connectivity options on the Xiaomi Redmi Note 5 include 4G VoLTE, Wi-Fi 802.11 b/g/n, Bluetooth, 3.5mm headphone jack, and Micro-USB. It is powered by a 4000mAh battery, with 5V/2A fast charging. The power adapter it ships with has been designed for India, said to withstand power surges common in the country. It measures 158.5×75.45×8.05mm and weighs 180 grams. The dual-SIM Xiaomi Redmi Note 5 Pro, like the Redmi Note 5, runs MIUI 9 based on Android Nougat. It too sports a 5.99-inch full-HD (1080×2160 pixels) display with an 18:9 aspect ratio, 450-nit brightness, 83 percent NTSC colour gamut, and 2.5D curved glass. It is powered by an octa-core Snapdragon 636 SoC, clocked at up to 1.8GHz, coupled with the Adreno 509 GPU and either 4GB or 6GB of RAM. It is claimed to be the first device in the world with the Snapdragon 636 SoC, and makes it the “fastest Redmi Note ever” with an AnTuTu score of 109,692. It bears a fingerprint sensor on the rear panel. The Xiaomi Redmi Note 5 Pro sports a dual rear camera setup, with the 12-megapixel primary sensor sporting an aperture of f/2.2 and a 1.25-micron pixel size, while the 5-megapixel secondary sensor has a f/2.0 aperture and 1.12-micron pixel size. The dual rear camera setup is accompanied by an LED flash module. On the front, it bears a 20-megapixel Sony IMX376 sensor complete with an LED selfie-light module and Beautify 4.0 beautification tech that’s been optimised for India. Both front and rear cameras offer Portrait mode Bokeh effects. The Xiaomi Redmi Note 5 Pro comes in a single storage variant – 64GB – which is expandable via microSD card in a hybrid dual-SIM format. Connectivity options on the Xiaomi Redmi Note 5 Pro include 4G VoLTE, Wi-Fi 802.11 b/g/n, Bluetooth, 3.5mm headphone jack, and Micro-USB. It is powered by a 4000mAh battery that’s rated to deliver up to 14 hours of continuous video playback, with 5V/2A fast charging. It measures 158.6×75.4×8.05mm and weighs 181 grams.